Our Sublimated Designs, Sublimated T-Shirts, Sublimated Running Vests, all come with an MOQ of 20 items, with a Maximum capacity of 200,000 per month. We make all these ranges 'Made to Order'. Want to get a Quote now? Please contact us immediately. We are currently the leading UK Supplier of Sublimated Running Vests, this is very much our speciality, with over ten years experience and 50 years within our Team. We offer tailored, personalised service from start to finish and have the best quality finish on the market, with Samples available upon request. With our premium service for both print and durability, we cannot be beaten. We supply some of the leading charities such as AGE UK, British Skin Foundation, COCO and St Oswald's Hospice. With our Price promise guarantee on All Sublimated products, we will not be beaten. We only guarantee this on any genuine like for like quotation's, and usually, our first price is both our Fairest and most competitive, but don't be afraid to ask. Sports vests all made with 140gsm Qwick-Dri™ fabric but other fabrics and weights available on request. Other quality and weights available. Washes on cool temperatures and dries quickly and has colour guarantees on all fabrics. CUSTOM TEAMWEAR are the UK LEADING suppliers of sublimation charity running vests, custom manufactured to the highest quality and with great lead times. What exactly is sublimation printing? Sublimation is a printing transfer process that uses heat-sensitive sublimation inks to permanently dye synthetic fabrics. As the sublimation process dyes the garment, the colour is “in” the fabric and not on top, as is the case with traditional screen-printing methods. This gives a much better feel to the garment, as well as colourfastness and the ability to print unlimited colours. Want to find out more about our sublimated charity running vests or T-Shirts? We always aim to get back to you within 12 working hours. We also don't just do Running Vests; we do Sublimation Cycle jerseys, sublimated T-Shirts and also Sublimated Printed Garments. We prefer to discuss these orders over the phone and email so that we can be transparent on orders and any issues. 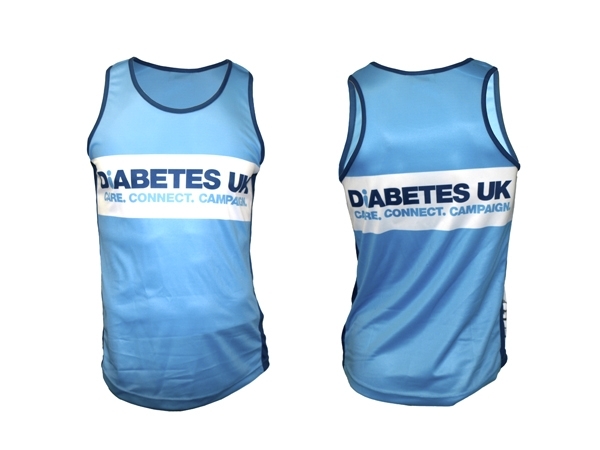 WHY USE CUSTOM TEAMWEAR FOR CHARITY RUNNING VESTS? Leading UK supplier to the charity market. Unbeatable pricing on premium sublimation running vests for charities. Quickly does it! Rapid turnaround with a 3-6 week lead time. Emergency orders are available on request. No hidden costs or fees. What you see is what you get. We design & manufacture all Types of Event Clothing including Event T-shirts, Vests, Hoodies all printed or embroidered. The Success of your event is our main priority, so it is our job to make your life easier when it comes to organising your Clothing or T-Shirts. With bespoke designs, quick turnaround and our Price promise guarantee, why would you choose to go anywhere else? We design and manufacture premium quality event clothing, with a remarkably quick one day to 6 weeks lead time (depending on quantity and intricacy of design). We won't let you down whatever timescale we agree. We’ll beat any genuine like for like Quotation; We’re so confident in our prices that quote find a like for like better and we will match and give you 5% cheaper. Ideally, you give us around 3-6 weeks from design to supply, to optimise our cheapest quotations. With our personalised design service, our delivery Guarantee and our ability to tailor your orders to suit your needs, we cover all items including the below. If it is a Gift bag or Goody Bag you are looking for, Custom Teamwear has the answer. We link to some of the leading brands such as More Mile, Start Fitness and Oatein and can provide everything from Bars, Bottles, Water, Drawstring Bags, Diary. You name it, we can supply it, at cost price or less depending on the event or your requirements. Let us know what you would like, and we can do the rest. We want to make your event run as smoothly as possible and work with all leading races and events on solutions and improvements. Teamed alongside your printed event t-shirts for staff and participants, you’ll be able to get branded giveaway products and make sure your event gets maximum exposure. Contact us today for more information, on how we can help you to create a splash with your event.